All of us have taken our lumps at some time in our lives: making a mistake at work, having an unfortunate slip of the tongue, or in extreme cases, being on the wrong end of a moving fist. With luck, the damage is fleeting and temporary. Snow covered roads create a different phenomenon: leaving our lumps. Parking lots look like the aftermath of a minor avalanche. Packed ice and slush chunks ranging from fist sized to some that are just smaller than the iceberg that sank the Titanic occupy parking spaces, hidden by behemoth four-wheel drive trucks crookedly parked in every other spot. Of course, if there isn’t a small glacier in the spot, there is a shopping cart instead…or sometimes both. It adds to an increasing stressful shopping experience, which becomes worse between Thanksgiving and mid-January. These lumps add a level of suspense to freeway driving, too. Even if the road is free from ice, an ice boulder dislodging from the vehicle in front of you results either in an explosion of slush and ice chunks or a rock-like object bouncing and skidding on the roadway. Leaving a lump can cause someone to take some lumps. Minneapolis chose not to declare a snow removal emergency November 10, the metro area’s first snowstorm of the season. The side streets in the Uptown and East Calhoun neighborhoods have ridges of ice and packed snow because the plows had to swerve around street parked cars. Parallel parking a mid-sized sedan in a residential neighborhood with narrow streets is a challenge. The ice berms and basketball sized frozen wheel well detritus add several extra layers of complexity. A three day stretch of above freezing weather is forecast for Friday through Sunday. Perhaps the warmer weather will improve the streets there. Next Thursday is Thanksgiving here in the United States. If the weather holds up, I hope to spend time with my family. If the weather is fickle, I will attempt to make a dinner here, complete with the requisite lumpy gravy and clumpy potatoes. I guess I will have my lumps and eat them, too. Mother Nature and the calendar are often at odds. The calendar says December 21 is the start of winter, but the landscape and temperatures point to winter starting on Monday. Not only was the temperature sliding into winter, but also were the commuters attempting to get to work. Sunday was the last day of above normal temperatures. Since Monday, the daily high temperature fell below the average low temperature. The long-range forecasts hint that managing a high of even freezing (0°C or 32°F) will not happen for another ten days. That would be the time when our normal daily high drops to freezing. Monday’s snowstorm surprised many people. The weather forecasters predicted between 8″ – 16″ throughout the metro area, but unusually dry air, a more northerly storm track, and warmer than forecast temperatures conspired against them. There were areas in the northern exurbs getting over a foot of snow. Some of my friends with the option to telecommute did so to stay off the roads. My back yard picked up less than 2″ of snow along with 0.14″ of rain. I mowed the yard on Sunday to grind up the last of the fallen leaves. It was nearly one of the rare years where lawn mowers and snow throwers got workouts within a 24 hour period. My asphalt driveway retained enough heat to melt off the snow on its own. There are some good things about the snowfall. The thin coating of snow on the ground is ideal for bonfires. Strong northwest winds make it difficult to keep a fire burning. Perhaps the wind will cooperate this weekend. Local ski hills are opening. The ground is not totally frozen so the snow that fell is slowly melting and soaking into the ground. That will help make up for a dry September and October. Last winter came early, stayed late, and was quite obnoxious with nearly double the average snowfall and with snow piles not melting until July. This year, the snow held off until November rather than mid-October. Here’s hoping spring arrives in March rather than in June. Spending time with family and loved ones is precious. My hope is the Thanksgiving, Christmas, and New Year’s travelers are not affected by inclement weather, and the only sliding into winter happens to children on sleds. Bonfire season got off to a good start this year. 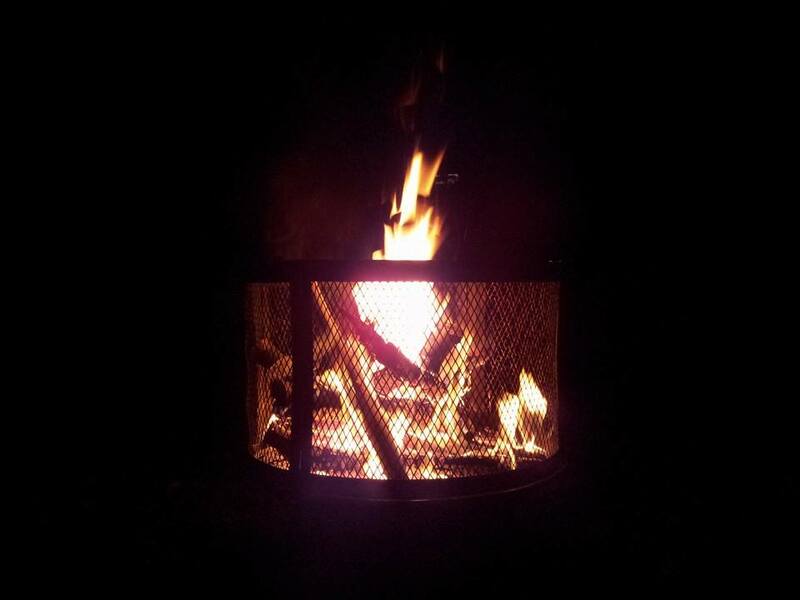 There was just enough rain in September and early October to keep a bonfire from burning down the neighborhood and the wind would become still after dark. Most of the tree leaves fell off in three brief periods which also helped minimize risk of an out of control fire. Warm days, almost summer-like, faded into cool evenings. It was nice to get several evenings of having bonfires and not feel guilty about incomplete yard work. November is starting out in its usual Dr. Jekyll and Mr. Hyde self. Sharp temperature swings, gloomy skies and strong winds prevailed the first few days of the month. Now, the dreaded “s” word (snow) is creeping into tonight’s forecast, although some areas north of the metro area have enough to turn grassy areas white. Strong winds and a lack of rain the past week or so made having a bonfire impractical and dangerous. We are the only creatures that have mastered making and, for most part, controlling fire. I have not seen any raccoons with Zippo lighters or squirrels with matches yet. Without fire, modern civilization would never flourish. Wood and stone can only build so much. Building an automobile or a computer requires fire for smelting metal ores or restructuring aromatic hydrocarbons to make polymers. Ancient civilizations thought of fire as one of the essential elements. Cultural mythologies had stories of gaining control of fire by theft from the gods or a gift from an animal. Fire gave humanity the ability to keep wild animals at bay, to harden the sharpened points of wooden spears and arrows, to cook food, and eventually, to make metal. Perhaps that is why people generally are fascinated with fire. Fire also gave humans the ability to make paper, plastic and ink which the glut of candidate signs from this year’s mid-term elections will confirm. Not every advancement is perfect. And yes, fire can warm up a bitter cold day and light up a dark night. Cooking hot dogs, toasting marshmallows or making S’mores are an added benefit, of course. Fire is also the perfect document destruction method and is much more fun and faster than running a shredder. Gathering friends and family around a fire on a still autumn night is very relaxing and quite fun, even for the fire tender. Watching someone with a lot of camping experience keep a fire pit maintained and smiling ear to ear is one of the many benefits. There is something primal about fire, but not in a fearful way. That separates us from other creatures. There will be some breaks in the weather and I am certain that a few more fires will burn before it is too cold to stand outside for any length of time, or the snow is too deep to trudge to the woodpile. Until then, enjoy a cozy fire and the company of loved ones.